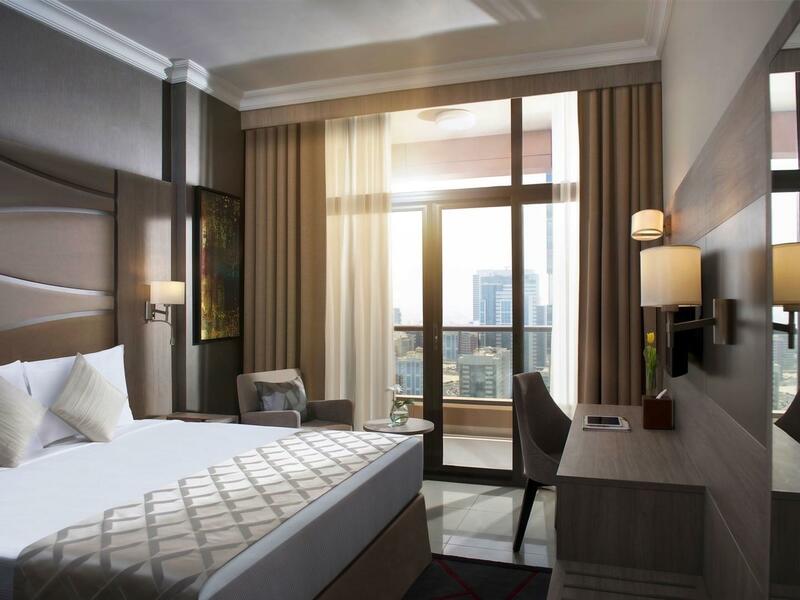 With a balcony to enjoy beautiful views of Dubai city, this suite boasts 70sqm of space. 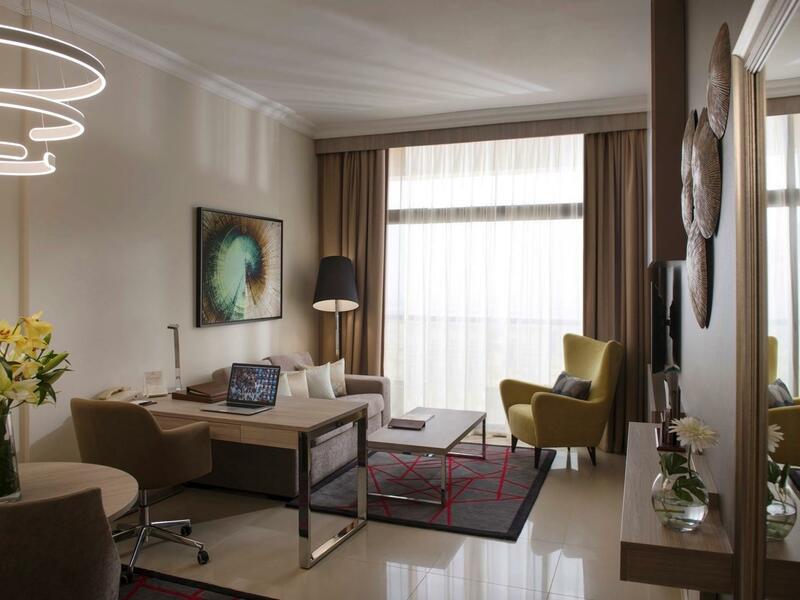 The interiors of this hotel room in Dubai feature comfortable furniture complemented by elegantly designed fixtures and appliances. 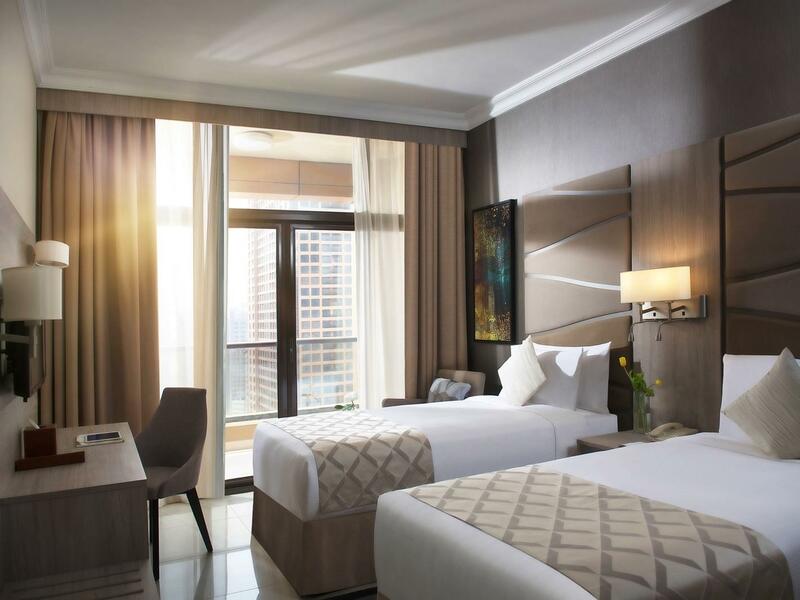 Our premium suite is an ideal accommodation for individual traveler or a couple, consisting of a spacious living room, bedroom with a king size or two twin beds, kitchenette, one full bathroom and luggage room. Complimentary Wi-Fi is provided during the stay. A comfortable, simple and modern ambiance for both working and unwinding is created in the living room with a 2-seater or 3-seater sofa that can be converted to a sofa bed and an arm-chair, a coffee table, a floor lamp, office desk with a rolling desk chair, and table lamp, dining table with 2 chairs, 40-inch flat screen TV and full length mirror. The bedroom features a balcony and detached bathroom and equipped with 1 king size or 2 twin beds, 2 bedside tables with 2 lamps and 2 reading lamps, an armchair and a dressing table with chair, 32-inch flat screen TV, built-in wardrobes, built-in luggage racks, wall mirror with 2 lamps, a full-length mirror, universal plug points and built in USB wall chargers. The wardrobe in the bedroom includes a torch, a safe box, slippers, bathrobe and a prayer mat. For the bedroom, the warmth of the earthy tone-on-tone color palette of white and beige creates an elegant and serene sanctuary. The bathroom features a bathtub with shower, toilet with bidet and branded amenities, a weighting scale, hair dryer, make up and wall mirror. The kitchenette of our suites which are dedicated to regular hotel stays is equipped with built-in cabinets, minibar, full-size fridge, microwave, kettle and utensils.